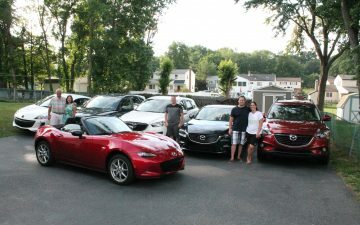 When does a car become a member of the family? Some people view their cars as appliances – just a way to get from home to work and back for a few years. When the payments are done, many people just trade their car in on a new model and forget they ever owned it. That’s not what this story is about. This is the story of Dan and Kathy Klager and their 2001 Mazda MPV, affectionately known as Minnie Van. After 15 years and over 191,000 miles, Minnie has become something more than just a vehicle in their garage. Over the years, the Klagers have taken Minnie to 39 states and the District of Columbia, and the van carries many memories. To keep their MPV in great condition, the Klagers are diligent about maintenance, and keep careful records of the van’s history. Minnie is still with the Klagers, and they have no plans to replace her. In the time they’ve spent together, the bond between the Klagers and Minnie has become more than just maintenance and reliability. It’s about the places and events that make up a family’s life together.